How Do We De-Suburbanize the Suburbs? Phoenix, Arizona, is a famously fast-growing city. But, instead of growing up, the city has almost uniformly grown out, with terracotta-tiled subdivisions consuming the adjacent desert at a frightening rate: some estimates claim its suburbs grew an acre per hour during the early 2000s housing boom. A story on Marketplace discusses how Phoenix has been trying to reverse that pattern in recent years. Specifically, developers want to take a low-density neighborhood called Grant Park and build a 14-acre project that will connect it to Phoenix's urban center. The neighborhood in question happens to be a Latino community separated from the city's downtown both physically (by railroad tracks) and economically. Developers plan to add housing and commercial space that would deliver services for residents but also lure people from the nearby downtown towers, creating a unified urbanized corridor. Grant Park has been the subject of unrealized redevelopment plans for years, but Eva Olivas, CEO of the Phoenix Revitalization Corporation, tells Marketplace he thinks this idea will work now because the timing is right: "On the macro level, nationally we are going through this period of intense urbanization." It's true that many American cities are working hard to revitalize their downtowns. But the part where we also try to make the suburbs more dense, walkable, and transit-friendly has proved more difficult. To truly de-suburbanize you have to dramatically increase density—both in building height and population—relocate services within walking distance, and then focus on redesigning the street experience to encourage people not to drive. This is a tall order in cities and towns which were designed explicitly for cars. Take One Paseo, for example, a proposed "neighborhood village" development outside San Diego that wants to create a downtown-like area for the surrounding city of Carmel Valley. The development includes a "Main Street" that will offer shops and restaurants and offices to serve the residents, ostensibly so they won't have to make trips to other urban areas, such as downtown San Diego. But the project has faced heavy opposition for years, including a petition that says it's too big, tall, and out of place, and that it will create major gridlock. A group called What Price Main Street is requesting changes to the plan to make it more appropriate to the low-slung suburban landscape. This strategy can be tricky. Even though the One Paseo proposal says it's creating density and walkability on what has been a vacant lot for years, it's not doing much to connect it to the rest of San Diego—which has always been planned around the idea of a "City of Villages." The area is not on the San Diego light rail system and the development hopes to add 3,650 parking spaces, meaning that people probably aren't going to treat it as a downtown at all. Without providing the right city services, such as transit, it's just a big mall that people are going to drive to—which is a problem when you're trying to take the suburban out of suburbia. Further, densifying these neighborhoods could ironically produce the opposite of the intended effect, unless strict zoning is in place: in other words, residents who don't like the way their neighborhood is changing might try to move even further away to get the lawns and driveways they originally desired. Instead of building new developments to fix suburbia, perhaps we have to start with correcting all the mistakes we made in the first place. Can we take stuff we built that's sprawly and spaced-out—like malls and office parks—and make it feel connected to the larger city? Georgia Tech architecture professor Ellen Dunham-Jones thinks so. 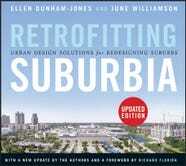 She wrote a book named Retrofitting Suburbia with June Williamson that calls for revamping what they've named "underperforming asphalt properties"—asphalt being the signature landscape of suburbia. Her ideas include turning dead box stores into community centers and parking lots into parks. This reclaiming of suburbia is happening in places like Bell Labs, the corporate campus designed by Eero Saarinen in 1962 that pretty much invented the idea of the suburban office park. The 472-acre campus is now being turned into a mixed-use development that will serve as a new center of Holmdel, New Jersey. According to Metropolis, "it's here that the building's new owner, Somerset Development, imagines a new urbanist temple to commerce. Plans are in place to revitalize the site as a town center for Holmdel, complete with urban amenities like shops and a coffee shop." What was once a suburban outpost prized for its isolation is being absorbed by the city around it—a city that Bell Labs helped to build by populating it with its employees who moved there. It's kind of awesomely poetic. We can also fix what's broken in a more incremental way, one that fills in the "gaps" from car-centric infrastructure. 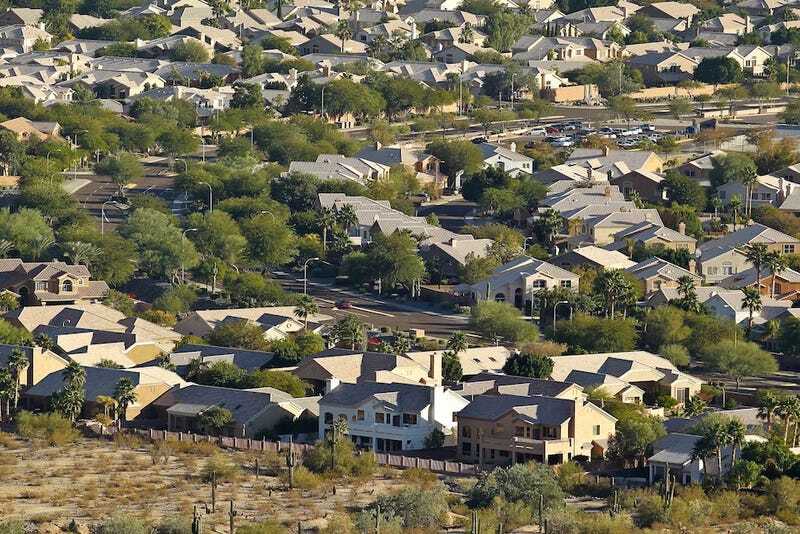 Back in Phoenix, the neighboring city of Mesa announced that it would be revising its general plan to include "sprawl repair" in 2014. With a population of 1.5 million—about the same size as Phoenix itself—Mesa is defined as a "boomburb," a quickly growing city inside a city, and much of that growth went unchecked as the city boomed. The idea here is to create "character areas" in different neighborhoods that connect parts of the city through walkable development. They even have a guidebook: the 2010 Sprawl Repair Manual, which offers "comprehensive guidance for transforming fragmented, isolated and car-dependent development into complete communities."